For thousands of years bread has been a basic staple worldwide. In the past “most of the world has gotten most of its calories from bread” (Oman Tribune On-line, “Bread the Giver of Life”). The roots of the phrase “bread is the staff of life” may be the Bible. Bread is mentioned often in scripture as an important essential for life and hospitality. The verse that relates bread and the staff of life is Ezekiel 4:16. Here God warns Jerusalem about coming punishment. Moreover he said unto me, Son of man, behold, I will break the staff of bread in Jerusalem. Earlier God gave Ezekiel an intriguing list of grains and legumes that he was to make into bread. Also take for yourself wheat, barley, beans, lentils, millet, and spelt; put them into one vessel, and make bread of them for yourself (Ezekiel 4:9). Today’s artisan bread makers appreciate the nutritional value of Ezekiel’s grains. Peter Reinhardt notes that the whole grain movement of the 1960s led to improved bread in the United States. “Whole grains became the symbol of a healthful, holistic way of life that had fallen by the wayside” (Artisan Bread Every Day, Peter Reinhardt, Ten Speed Press, Berkeley, CA, p.1). He adds that “part of the problem was most of the whole grains of that era, while nutritionally superior, weren’t particularly delicious (or even palatable), so they came to be labeled ‘health food’ breads, not fit for general consumption” (same source, p.1). Author Suzanne Robin reminds readers, “Nowhere in book of Ezekiel does God suggest that everyone eat Ezekiel’s bread or that it has any particular health benefits. To obtain all the nutrients in a recommended 2000-a-er-day diet, you would have to consume 25 slices a day” (Livestrong.com, “Ezekiel Diet”). That’s a lot of bread! It brings up the question of why God gave Ezekiel a recipe of grains and legumes with which to make bread? Was it to improve his strength? Was it to set an example of eating healthfully? Most Bible commentators agree that God’s purpose was not to promote health and nutrition. 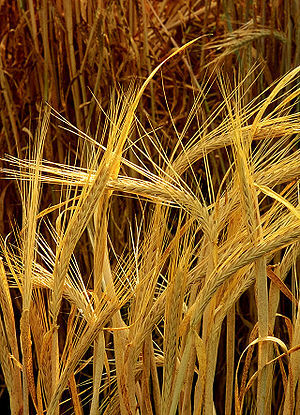 Gill’s commentary states that most bread was made of wheat, and only in times of poverty did the bread include barley. The other grains God proscribed were primarily used for cattle feed. Only in a time of adversity would flour be stretched out with inferior ingredients. Henry’s commentary, Clarke’s commentary, and the Geneva commentary agree that Ezekiel ate a bread of mixed grains, not for health, but to enact a time of famine. God measured the amount of bread Ezekiel could eat each day, and it was “the least a man could be kept alive with” (Henry’s Commentary, Ezekiel 4:9). Mixed grains indicated a scarcity in the necessities of life, a condition in which people “would be glad to eat whatever they could get” (Geneva Commentary, Ezekiel 4:9). Posted in bread, food, Notes, Uncategorized. Bookmark the permalink. web, except I know I am getting know-how all the time by reading such nice posts.